Recycling can prevent used motor oil being disposed of in landfill. Filtration can be used to recycle waste oil. High quality fuel oil can be processed from waste oil. The unit's large filtration surface and self-cleaning wiping system minimises blockage and results in less wasted product. 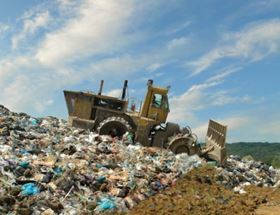 The United States Environmental Protection Agency (EPA) has published a document Collecting used oil for recycling/reuse. In it the EPA estimates that, in the United States alone, around 200 million gallons of used motor oil are improperly disposed of by being dumped on the ground, sent to landfill or poured down storm sewers and drains. The organisation adds that if all of the used oil that is improperly disposed of were properly managed, the United States could save thousands of barrels of oil each day. 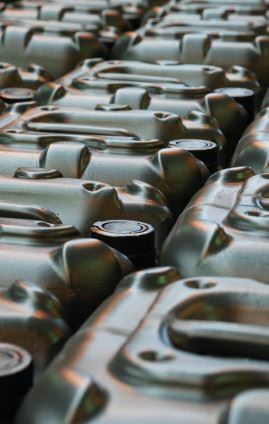 Used oil that is properly handled can be re-refined into lubricants, processed into fuel oils, and used as raw materials for the refining and petrochemical industries. Through waste oil recovery and reuse programmes, the hazard of improper waste oil disposal can be turned into a valuable resource. Companies are now taking advantage of a new generation of self-cleaning filter technology that can process waste oil into quality products more effectively, with less downtime and labour than possible with traditional equipment. Global Recuperation, a waste management recycling company based in Quebec, Canada, reclaims used motor oil and filters, along with other industrial commodities. Though waste oil is mandated for reuse in much of Canada, Eric Poisson, the company's president, wanted to capture an underserved market niche for a higher grade of fuel oil, made from processed waste oil. Traditionally, Global Recuperation and other processors in the Quebec-area filtered waste oil with static filter cartridges at 20-mesh (900 micron). But there were production challenges with this approach. In order to produce a cleaner, higher-grade fuel oil from waste oil and to streamline production, Global Recuperation turned to a self-cleaning filtration system from Russell Finex. According to Russell Finex, since the Self-Cleaning Russell Eco Filter® system integrates directly into the pipeline, it eliminates labour-intensive manual cleaning tasks such as changing filter bags or cleaning filtration baskets. The filter element is kept continuously clean via a unique spiral wiper design, ensuring optimum filtration efficiency. Because of its design, cleaning the filter between batch runs is quick and easy with minimal disruption during production changeovers. Additionally, a unique Q-Tap valve allows the sampling of freshly filtered material so quality can be easily monitored on the fly without interrupting production. Compared to previous manually-cleaned filters, the new filter system is saving the company a substantial amount of labour and downtime. Because the self-cleaning filter is totally enclosed, it also prevents outside pollutants from contaminating product and protects operators from any spillage or fumes. Users see substantial improvement in product purity, throughput and waste elimination; and a choice of easily swapped filter elements can give additional flexibility to meet the quality demands of customers. Poisson sums up the benefit of switching to the self-cleaning filter: a safer environment for his operators and business, as well as for society. “With higher margins on a higher-quality fuel oil product, along with significantly lower labour costs, we'll achieve return on investment on the Eco Filter within a year,” he says. The Self-Cleaning Russell Eco Filter® accurately removes oversize impurities from all types of liquids and pastes. The SpiroKlene™ system continuously cleans the surface of the filter element and ensures optimum filtration efficiency. This allows for high and consistent flows, which are ideal for filling operations and continuous production lines. The company says that the Russell filter gives higher production rates compared to other filtration methods, as there are no production stoppages to change filter bags or cartridges. According to Russell Finex, the range of filters is designed for ease of operation and maintenance. They are claimed to be simple to disassemble and clean without tools, allowing for fast and efficient product line changeovers, therefore increasing productivity. The units fit into existing production lines, providing considerable filtration capacity without requiring excessive space. Other features include rotating wiper blades to keep the apertures of the filter element clean and flow rates even, which minimises pressure drops across the filter. 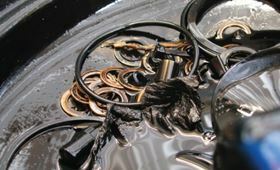 In addition, they offer tool-free disassembly for quick and easy cleaning. The filters have top inlet/bottom outlet (on-line) or top inlet/top outlet (in-line) arrangements for ease of connectivity. Filter element options include wedgewire or unique defined hole microscreen giving high flow rates and accurate removal of oversized contamination.